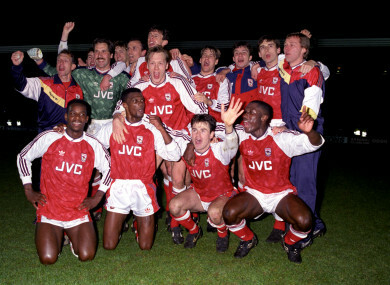 Arsenal celebrate winning the League Championship in 1991: (back row, l-r) coach Stewart Houston, Nigel Winterburn, David Seaman, Tony Adams, Steve Bould, David O'Leary, Paul Merson, David Hillier, Alan Smith, physio Gary Lewin; (front row, l-r) Michael Thomas, Paul Davis, Lee Dixon, Anders Limpar, Kevin Campbell. THE FOLLOWING PASSAGE is an extract from ‘Heads Up’ by Alan Smith. In an attempt to free the knee up, I went to hospital one day to have some fluid removed. Never a huge fan of needles, I looked the other way, eyes watering as the long needle went in. This wasn’t nice. But the day got even worse when the syringe began to fill with a dirty brown substance featuring some nasty-looking debris. Gary Lewin and John King exchanged a look. They hadn’t expected this. The consistency of the fluid made them concerned for what was going on inside that joint. Fearing the worst, I went to see Ken Friar, Arsenal’s managing director, to see what the club would do should I have to pack up. Financially, I mean. What kind of money would I get? For the first time in my entire career, one that had been thankfully short on serious injuries, I began to contemplate life after football and how we would manage without its safety net. So off I went, climbing the famous staircase rising from the Marble Halls, the one that led to the boardroom, as well as the gaffer’s office and that of our managing director. Walking through the heavy oak door I got straight to the point, nervously asking Mr Friar roughly where I stood. ‘Oh, don’t worry about all that,’ he fired back straight away. Yes, I thought, but have you spoken to Gary since he saw that horrible stuff coming out of my knee? Maybe not. As Arsenal’s physio for all my time at the club, Gary had come to mean so much to the whole squad, not just as a physio but as so many other things – a go-to fixer, for instance, who, at late notice, could always sort out that extra ticket or car-park pass. Most importantly, his was the number you rang should one of your family get ill. But the fact that this bubbly, good-natured character was forever on hand meant he would also receive some strange phone calls at very odd times. Paul Merson, for instance, once rang in the middle of the night because, while asleep, he’d poked himself in the eye. ‘What shall I do, Gaz?’ asked a worried Merse. ‘Go back to sleep,’ came the succinct reply. Some years later, Freddie Ljungberg rang at one o’clock in the morning to ask if, at this time of night, he was okay to park on double yellow lines. These were the days before player liaison officers, those poor souls who run around catering for every need of players who might be feeling totally lost in a strange country. Gary did it all back then. I don’t know how he managed or indeed found the time. But he did, always with a smile. So when he said I was going to be OK, it usually meant a fair bit. If he was confident, I should be as well. And he did remain confident, at least to my face, even after that worrying hospital trip. I certainly wasn’t though. I knew my own body and one part didn’t feel right. An ominous feeling had firmly set in. Because of that, I asked Stewart Houston, our caretaker manager following George’s dismissal, if I could join the squad on the upcoming end-of-season trip to China and Hong Kong. Injured, I wasn’t originally on the list but that changed after Stewart heard my reasons. I explained this could very well be my last ever jaunt as a professional footballer. I badly wanted to go, just to be part of the group, enjoy the craic, even though I couldn’t play in any of the friendlies. As planned, I lapped up every second of that tour. Having never been to China before, it was fascinating just watching the locals go about their daily lives. If the swarms of people on bikes were expected, I couldn’t believe the numbers having their hair cut on street corners, the hair covering whole pavements in parts of Beijing. In other parts, the ancient temples gave us a chance to take in some culture, which doesn’t come naturally to every footballer. But we trod the tourist trail that year with a fair bit of enthusiasm, taken aback by the aura of this strange, spiritual place, a land unlike any other I had visited before. Hong Kong offered something different with its high-rise intensity. The nightlife, for a start, was always going to get tested following the final friendly of that memorable trip. Unfortunately, that night in Wan Chai got famously out of hand when Ray Parlour was arrested for a drunken altercation. I had been drinking with Ray and several others that night but, come about four in the morning, I’d just about had enough so headed back to the hotel as Ray and a couple of others moved to another bar. On surfacing the next morning, we were all shocked to hear Ray was in prison for punching a taxi driver after throwing prawn crackers into his car. If the second bit sounded like our mischievous teammate, the first part really didn’t. You’d never call the Romford Pelé aggressive. Nothing like. Even so, he admitted the charges in court, sincerely apologised and stumped up the fines handed out by the judge and, later, the club. This harsh lesson, I reckon, proved a key turning point for someone who sorted himself out soon after that episode, going on to excel under Arsène Wenger. For me, meanwhile, the chance to play for Wenger, or even Bruce Rioch, had gone up in smoke. The Far East soon got swapped for the East End and a fateful date at the London Independent Hospital. Don’t ask me what I thought on emerging from that building. The world suddenly felt like a much different place. Gary had gone in with me to offer support, as he always did in these situations. Standing there on the pavement outside the hospital, he looked as shell-shocked as me, knocked for six by the verdict. Forever conscientious, he took this kind of news personally, as if it marked a failure in his own work. It didn’t, of course. There was nothing he could do or could have done differently. ‘Heads Up’ by Alan Smith is published by Little Brown. More info here. Email “'Paul Merson once rang in the middle of the night because, while asleep, he’d poked himself in the eye'”. Feedback on “'Paul Merson once rang in the middle of the night because, while asleep, he’d poked himself in the eye'”.